Hypothetical types of biochemistry are forms of biochemistry speculated to be scientifically viable but not proven to exist at this time. The kinds of living organisms currently known on Earth all use carbon compounds for basic structural and metabolic functions, water as a solvent, and DNA or RNA to define and control their form. If life exists on other planets or moons, it may be chemically similar; it is also possible that there are organisms with quite different chemistries—for instance, involving other classes of carbon compounds, compounds of another element, or another solvent in place of water. The possibility of life-forms being based on "alternative" biochemistries is the topic of an ongoing scientific discussion, informed by what is known about extraterrestrial environments and about the chemical behaviour of various elements and compounds. It is also a common subject in science fiction. The element silicon has been much discussed as a hypothetical alternative to carbon. Silicon is in the same group as carbon on the periodic table and, like carbon, it is tetravalent, although the silicon analogs of organic compounds are generally less stable. Hypothetical alternatives to water include ammonia, which, like water, is a polar molecule, and cosmically abundant; and non-polar hydrocarbon solvents such as methane and ethane, which are known to exist in liquid form on the surface of Titan. The Arecibo message (1974) sent information into space about basic chemistry of Earth life. A shadow biosphere is a hypothetical microbial biosphere of Earth that uses radically different biochemical and molecular processes than currently known life. Although life on Earth is relatively well-studied, the shadow biosphere may still remain unnoticed because the exploration of the microbial world targets primarily the biochemistry of the macro-organisms. Perhaps the least unusual alternative biochemistry would be one with differing chirality of its biomolecules. In known Earth-based life, amino acids are almost universally of the L form and sugars are of the D form. Molecules of opposite chirality have identical chemical properties to their mirrored forms, so life that used D amino acids or L sugars may be possible; molecules of such a chirality, however, would be incompatible with organisms using the opposing chirality molecules. Amino acids whose chirality is opposite to the norm are found on Earth, and these substances are generally thought to result from decay of organisms of normal chirality. However, physicist Paul Davies speculates that some of them might be products of "anti-chiral" life. It is questionable, however, whether such a biochemistry would be truly alien. Although it would certainly be an alternative stereochemistry, molecules that are overwhelmingly found in one enantiomer throughout the vast majority of organisms can nonetheless often be found in another enantiomer in different (often basal) organisms such as in comparisons between members of Archaea and other domains, making it an open topic whether an alternative stereochemistry is truly novel. On Earth, all known living things have a carbon-based structure and system. Scientists have speculated about the pros and cons of using atoms other than carbon to form the molecular structures necessary for life, but no one has proposed a theory employing such atoms to form all the necessary structures. However, as Carl Sagan argued, it is very difficult to be certain whether a statement that applies to all life on Earth will turn out to apply to all life throughout the universe. Sagan used the term "carbon chauvinism" for such an assumption. He regarded silicon and germanium as conceivable alternatives to carbon; but, on the other hand, he noted that carbon does seem more chemically versatile and is more abundant in the cosmos. Structure of silane, analog of methane. Structure of the silicone polydimethylsiloxane (PDMS). The silicon atom has been much discussed as the basis for an alternative biochemical system, because silicon has many chemical properties similar to those of carbon and is in the same group of the periodic table, the carbon group. Like carbon, silicon can create molecules that are sufficiently large to carry biological information. However, silicon has several drawbacks as an alternative to carbon. Silicon, unlike carbon, lacks the ability to form chemical bonds with diverse types of atoms as is necessary for the chemical versatility required for metabolism. Elements creating organic functional groups with carbon include hydrogen, oxygen, nitrogen, phosphorus, sulfur, and metals such as iron, magnesium, and zinc. Silicon, on the other hand, interacts with very few other types of atoms. Moreover, where it does interact with other atoms, silicon creates molecules that have been described as "monotonous compared with the combinatorial universe of organic macromolecules". This is because silicon atoms are much bigger, having a larger mass and atomic radius, and so have difficulty forming double bonds (the double bonded carbon is part of the carbonyl group, a fundamental motif of bio-organic chemistry). Silanes, which are chemical compounds of hydrogen and silicon that are analogous to the alkane hydrocarbons, are highly reactive with water, and long-chain silanes spontaneously decompose. Molecules incorporating polymers of alternating silicon and oxygen atoms instead of direct bonds between silicon, known collectively as silicones, are much more stable. It has been suggested that silicone-based chemicals would be more stable than equivalent hydrocarbons in a sulfuric-acid-rich environment, as is found in some extraterrestrial locations. Of the varieties of molecules identified in the interstellar medium as of 1998[update], 84 are based on carbon while only 8 are based on silicon. Moreover, of those 8 compounds, four also include carbon within them. The cosmic abundance of carbon to silicon is roughly 10 to 1. This may suggest a greater variety of complex carbon compounds throughout the cosmos, providing less of a foundation on which to build silicon-based biologies, at least under the conditions prevalent on the surface of planets. Also, even though Earth and other terrestrial planets are exceptionally silicon-rich and carbon-poor (the relative abundance of silicon to carbon in Earth's crust is roughly 925:1), terrestrial life is carbon-based. The fact that carbon is used instead of silicon, may be evidence that silicon is poorly suited for biochemistry on Earth-like planets. Reasons for which may be that silicon is less versatile than carbon in forming compounds, that the compounds formed by silicon are unstable, and that it blocks the flow of heat. Even so, biogenic silica is used by some Earth life, such as the silicate skeletal structure of diatoms. According to the clay hypothesis of A. G. Cairns-Smith, silicate minerals in water played a crucial role in abiogenesis: they replicated their crystal structures, interacted with carbon compounds, and were the precursors of carbon-based life. Although not observed in nature, carbon–silicon bonds have been added to biochemistry by using directed evolution (artificial selection). A heme containing cytochrome c protein from Rhodothermus marinus has been engineered using directed evolution to catalyze the formation of new carbon–silicon bonds between hydrosilanes and diazo compounds. Silicon compounds may possibly be biologically useful under temperatures or pressures different from the surface of a terrestrial planet, either in conjunction with or in a role less directly analogous to carbon. Polysilanols, the silicon compounds corresponding to sugars, are soluble in liquid nitrogen, suggesting that they could play a role in very low temperature biochemistry. In cinematic and literary science fiction, at a moment when man-made machines cross from nonliving to living, it is often posited, this new form would be the first example of non-carbon-based life. Since the advent of the microprocessor in the late 1960s, these machines are often classed as computers (or computer-guided robots) and filed under "silicon-based life", even though the silicon backing matrix of these processors is not nearly as fundamental to their operation as carbon is for "wet life". Boranes are dangerously explosive in Earth's atmosphere, but would be more stable in a reducing environment. However, boron's low cosmic abundance makes it less likely as a base for life than carbon. Arsenic, which is chemically similar to phosphorus, while poisonous for most life forms on Earth, is incorporated into the biochemistry of some organisms. Some marine algae incorporate arsenic into complex organic molecules such as arsenosugars and arsenobetaines. Fungi and bacteria can produce volatile methylated arsenic compounds. Arsenate reduction and arsenite oxidation have been observed in microbes (Chrysiogenes arsenatis). Additionally, some prokaryotes can use arsenate as a terminal electron acceptor during anaerobic growth and some can utilize arsenite as an electron donor to generate energy. It has been speculated that the earliest life forms on Earth may have used arsenic in place of phosphorus in the structure of their DNA. A common objection to this scenario is that arsenate esters are so much less stable to hydrolysis than corresponding phosphate esters that arsenic is poorly suited for this function. The authors of a 2010 geomicrobiology study, supported in part by NASA, have postulated that a bacterium, named GFAJ-1, collected in the sediments of Mono Lake in eastern California, can employ such 'arsenic DNA' when cultured without phosphorus. They proposed that the bacterium may employ high levels of poly-β-hydroxybutyrate or other means to reduce the effective concentration of water and stabilize its arsenate esters. This claim was heavily criticized almost immediately after publication for the perceived lack of appropriate controls. Science writer Carl Zimmer contacted several scientists for an assessment: "I reached out to a dozen experts ... Almost unanimously, they think the NASA scientists have failed to make their case". Other authors were unable to reproduce their results and showed that the study had issues with phosphate contamination, suggesting that the low amounts present could sustain extremophile lifeforms. Alternatively, it was suggested that GFAJ-1 cells grow by recycling phosphate from degraded ribosomes, rather than by replacing it with arsenate. Carl Sagan speculated alien life might use ammonia, hydrocarbons or hydrogen fluoride instead of water. In addition to carbon compounds, all currently known terrestrial life also requires water as a solvent. This has led to discussions about whether water is the only liquid capable of filling that role. The idea that an extraterrestrial life-form might be based on a solvent other than water has been taken seriously in recent scientific literature by the biochemist Steven Benner, and by the astrobiological committee chaired by John A. Baross. Solvents discussed by the Baross committee include ammonia, sulfuric acid, formamide, hydrocarbons, and (at temperatures much lower than Earth's) liquid nitrogen, or hydrogen in the form of a supercritical fluid. Carl Sagan once described himself as both a carbon chauvinist and a water chauvinist; however on another occasion he said he was a carbon chauvinist but "not that much of a water chauvinist". He speculated on hydrocarbons,:11 hydrofluoric acid, and ammonia as possible alternatives to water. A complexity which leads to a large number of permutations of possible reaction paths including acid-base chemistry, H+ cations, OH- anions, hydrogen bonding, van der Waals bonding, dipole-dipole and other polar interactions, aqueous solvent cages, and hydrolysis. This complexity offers a large number of pathways for evolution to produce life, many other solvents have dramatically fewer possible reactions which severely limits evolution. Water does not combust in oxygen because it is already the combustion product of hydrogen with oxygen. Most alternative solvents are not stable in an oxygen rich atmosphere so it is highly unlikely those liquids could support aerobic life. water is a room temperature liquid leading to a large population of quantum transition states required to overcome reaction barriers. Cryogenic liquids (such as liquid methane) have exponentially lower transition state populations which are needed for life based on chemical reactions. This leads to chemical reaction rates which are so slow as to preclude the development of any life based on chemical reactions. The solid (ice) has lower density than the liquid, so ice floats on the liquid. This is why bodies of water freeze over but do not freeze solid (from the bottom up). If ice were denser than liquid water (as is true for nearly all other compounds), then large bodies of liquid would slowly freeze solid, which would not be conducive to the formation of life. Water as a compound is cosmically abundant, although much of it is in the form of vapour or ice. Subsurface liquid water is considered likely or possible on several of the outer moons: Enceladus (where geysers have been observed), Europa, Titan, and Ganymede. Earth and Titan are the only worlds currently known to have stable bodies of liquid on their surfaces. Not all properties of water are necessarily advantageous for life, however. For instance, water ice has a high albedo, meaning that it reflects a significant quantity of light and heat from the Sun. During ice ages, as reflective ice builds up over the surface of the water, the effects of global cooling are increased. There are some properties that make certain compounds and elements much more favorable than others as solvents in a successful biosphere. The solvent must be able to exist in liquid equilibrium over a range of temperatures the planetary object would normally encounter. Because boiling points vary with the pressure, the question tends not to be does the prospective solvent remain liquid, but at what pressure. For example, hydrogen cyanide has a narrow liquid phase temperature range at 1 atmosphere, but in an atmosphere with the pressure of Venus, with 92 bars (91 atm) of pressure, it can indeed exist in liquid form over a wide temperature range. 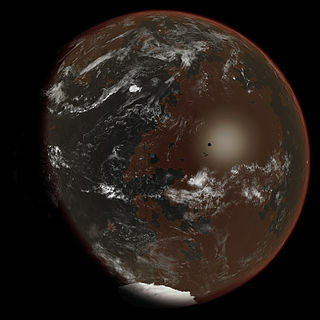 Artist's conception of how a planet with ammonia-based life might look. The ammonia molecule (NH3), like the water molecule, is abundant in the universe, being a compound of hydrogen (the simplest and most common element) with another very common element, nitrogen. The possible role of liquid ammonia as an alternative solvent for life is an idea that goes back at least to 1954, when J.B.S. Haldane raised the topic at a symposium about life's origin. Numerous chemical reactions are possible in an ammonia solution, and liquid ammonia has chemical similarities with water. Ammonia can dissolve most organic molecules at least as well as water does and, in addition, it is capable of dissolving many elemental metals. Haldane made the point that various common water-related organic compounds have ammonia-related analogs; for instance the ammonia-related amine group (-NH2) is analogous to the water-related hydroxyl group (-OH). Ammonia, like water, can either accept or donate an H+ ion. When ammonia accepts an H+, it forms the ammonium cation (NH4+), analogous to hydronium (H3O+). When it donates an H+ ion, it forms the amide anion (NH2−), analogous to the hydroxide anion (OH−). Compared to water, however, ammonia is more inclined to accept an H+ ion, and less inclined to donate one; it is a stronger nucleophile. Ammonia added to water functions as Arrhenius base: it increases the concentration of the anion hydroxide. Conversely, using a solvent system definition of acidity and basicity, water added to liquid ammonia functions as an acid, because it increases the concentration of the cation ammonium. The carbonyl group (C=O), which is much used in terrestrial biochemistry, would not be stable in ammonia solution, but the analogous imine group (C=NH) could be used instead. However, ammonia has some problems as a basis for life. The hydrogen bonds between ammonia molecules are weaker than those in water, causing ammonia's heat of vaporization to be half that of water, its surface tension to be a third, and reducing its ability to concentrate non-polar molecules through a hydrophobic effect. Gerald Feinberg and Robert Shapiro have questioned whether ammonia could hold prebiotic molecules together well enough to allow the emergence of a self-reproducing system. Ammonia is also flammable in oxygen, and could not exist sustainably in an environment suitable for aerobic metabolism. Titan's theorized internal structure, subsurface ocean shown blue. A biosphere based on ammonia would likely exist at temperatures or air pressures that are extremely unusual in relation to life on Earth. Life on Earth usually exists within the melting point and boiling point of water at normal pressure, between 0 °C (273 K) and 100 °C (373 K); at normal pressure ammonia's melting and boiling points are between −78 °C (195 K) and −33 °C (240 K). Chemical reactions generally proceed more slowly at a lower temperature. Therefore, ammonia-based life, if it exists, might metabolize more slowly and evolve more slowly than life on Earth. On the other hand, lower temperatures could also enable living systems to use chemical species that would be too unstable at Earth temperatures to be useful. Ammonia could be a liquid at Earth-like temperatures, but at much higher pressures; for example, at 60 atm, ammonia melts at −77 °C (196 K) and boils at 98 °C (371 K). Ammonia and ammonia–water mixtures remain liquid at temperatures far below the freezing point of pure water, so such biochemistries might be well suited to planets and moons orbiting outside the water-based habitability zone. Such conditions could exist, for example, under the surface of Saturn's largest moon Titan. Methane (CH4) is a simple hydrocarbon: that is, a compound of two of the most common elements in the cosmos, hydrogen and carbon. It has a cosmic abundance comparable with ammonia. Hydrocarbons could act as a solvent over a wide range of temperatures, but would lack polarity. Isaac Asimov, the biochemist and science fiction writer, suggested in 1981 that poly-lipids could form a substitute for proteins in a non-polar solvent such as methane. Lakes composed of a mixture of hydrocarbons, including methane and ethane, have been detected on the surface of Titan by the Cassini spacecraft. There is debate about the effectiveness of methane and other hydrocarbons as a solvent for life compared to water or ammonia. Water is a stronger solvent than the hydrocarbons, enabling easier transport of substances in a cell. However, water is also more chemically reactive, and can break down large organic molecules through hydrolysis. A life-form whose solvent was a hydrocarbon would not face the threat of its biomolecules being destroyed in this way. Also, the water molecule's tendency to form strong hydrogen bonds can interfere with internal hydrogen bonding in complex organic molecules. Life with a hydrocarbon solvent could make more use of hydrogen bonds within its biomolecules. Moreover, the strength of hydrogen bonds within biomolecules would be appropriate to a low-temperature biochemistry. Astrobiologist Chris McKay has argued, on thermodynamic grounds, that if life does exist on Titan's surface, using hydrocarbons as a solvent, it is likely also to use the more complex hydrocarbons as an energy source by reacting them with hydrogen, reducing ethane and acetylene to methane. Possible evidence for this form of life on Titan was identified in 2010 by Darrell Strobel of Johns Hopkins University; a greater abundance of molecular hydrogen in the upper atmospheric layers of Titan compared to the lower layers, arguing for a downward diffusion at a rate of roughly 1025 molecules per second and disappearance of hydrogen near Titan's surface. As Strobel noted, his findings were in line with the effects Chris McKay had predicted if methanogenic life-forms were present. The same year, another study showed low levels of acetylene on Titan's surface, which were interpreted by Chris McKay as consistent with the hypothesis of organisms reducing acetylene to methane. While restating the biological hypothesis, McKay cautioned that other explanations for the hydrogen and acetylene findings are to be considered more likely: the possibilities of yet unidentified physical or chemical processes (e.g. a non-living surface catalyst enabling acetylene to react with hydrogen), or flaws in the current models of material flow. He noted that even a non-biological catalyst effective at 95 K would in itself be a startling discovery. A hypothetical cell membrane termed an azotosome capable of functioning in liquid methane in Titan conditions was computer-modeled in a paper published in February 2015. Composed of acrylonitrile, a small molecule containing carbon, hydrogen, and nitrogen, it is predicted to have stability and flexibility in liquid methane comparable to that of a phospholipid bilayer (the type of cell membrane possessed by all life on Earth) in liquid water. An analysis of data obtained using the Atacama Large Millimeter / submillimeter Array (ALMA), completed in 2017, confirmed substantial amounts of acrylonitrile in Titan's atmosphere. Hydrogen fluoride (HF), like water, is a polar molecule, and due to its polarity it can dissolve many ionic compounds. Its melting point is −84 °C and its boiling point is 19.54 °C (at atmospheric pressure); the difference between the two is a little more than 100 K. HF also makes hydrogen bonds with its neighbor molecules, as do water and ammonia. It has been considered as a possible solvent for life by scientists such as Peter Sneath and Carl Sagan. HF is dangerous to the systems of molecules that Earth-life is made of, but certain other organic compounds, such as paraffin waxes, are stable with it. Like water and ammonia, liquid hydrogen fluoride supports an acid-base chemistry. Using a solvent system definition of acidity and basicity, nitric acid functions as a base when it is added to liquid HF. However, hydrogen fluoride is cosmically rare, unlike water, ammonia, and methane. Hydrogen sulfide is the closest chemical analog to water, but is less polar and a weaker inorganic solvent. Hydrogen sulfide is quite plentiful on Jupiter's moon Io, and may be in liquid form a short distance below the surface; and astrobiologist Dirk Schulze-Makuch has suggested it as a possible solvent for life there. On a planet with hydrogen-sulfide oceans the source of the hydrogen sulfide could come from volcanos, in which case it could be mixed in with a bit of hydrogen fluoride, which could help dissolve minerals. Hydrogen sulfide life might use a mixture of carbon monoxide and carbon dioxide as their carbon source. They might produce and live off of sulfur monoxide, which is analogous to oxygen (O2). Hydrogen sulfide, like hydrogen cyanide and ammonia, suffers from the small temperature range where it is liquid, though that, like that of hydrogen cyanide and ammonia, increases with increasing pressure. Silicon dioxide, also known as glass, silica, or quartz, is very abundant in the universe and has a large temperature range where it is liquid. However, its melting point is 1,600 to 1,725 °C (2,912 to 3,137 °F), so it would be impossible to make organic compounds in that temperature, because all of them would decompose. Silicates are similar to silicon dioxide and some could have lower boiling points than silica. Gerald Feinberg and Robert Shapiro have suggested that molten silicate rock could serve as a liquid medium for organisms with a chemistry based on silicon, oxygen, and other elements such as aluminium. Sulfuric acid in liquid form is strongly polar. It remains liquid at higher temperatures than water, its liquid range being 10 °C to 337 °C at a pressure of 1 atm, although above 300 °C it will slowly decompose. Sulfuric acid is known to be abundant in the clouds of Venus, in the form of aerosol droplets. In a biochemistry that used sulfuric acid as a solvent, the alkene group (C=C), with two carbon atoms joined by a double bond, could function analogously to the carbonyl group (C=O) in water-based biochemistry. A proposal has been made that life on Mars may exist and be using a mixture of water and hydrogen peroxide as its solvent. A 61.2% (by weight) mix of water and hydrogen peroxide has a freezing point of −56.5 °C, and also tends to super-cool rather than crystallize. It is also hygroscopic, an advantage in a water-scarce environment. Supercritical carbon dioxide has been proposed as a candidate for alternative biochemistry due to its ability to selectively dissolve organic compounds and assist the functioning of enzymes and because "super-Earth"- or "super-Venus"-type planets with dense high-pressure atmospheres may be common. Physicists have noted that, although photosynthesis on Earth generally involves green plants, a variety of other-colored plants could also support photosynthesis, essential for most life on Earth, and that other colors might be preferred in places that receive a different mix of stellar radiation than Earth. These studies indicate that, although blue photosynthetic plants would be less likely, yellow or red plants are plausible. Many Earth plants and animals undergo major biochemical changes during their life cycles as a response to changing environmental conditions, for example, by having a spore or hibernation state that can be sustained for years or even millennia between more active life stages. Thus, it would be biochemically possible to sustain life in environments that are only periodically consistent with life as we know it. For example, frogs in cold climates can survive for extended periods of time with most of their body water in a frozen state, whereas desert frogs in Australia can become inactive and dehydrate in dry periods, losing up to 75% of their fluids, yet return to life by rapidly rehydrating in wet periods. Either type of frog would appear biochemically inactive (i.e. not living) during dormant periods to anyone lacking a sensitive means of detecting low levels of metabolism. In 2007, Vadim N. Tsytovich and colleagues proposed that lifelike behaviors could be exhibited by dust particles suspended in a plasma, under conditions that might exist in space. Computer models showed that, when the dust became charged, the particles could self-organize into microscopic helical structures, and the authors offer "a rough sketch of a possible model of the helical grain structure reproduction". Isaac Asimov (1920–1992), biochemist and science fiction writer. William Bains, Cambridge biologist, a contributor to the journal Astrobiology. John Baross, oceanographer and astrobiologist, who chaired a committee of scientists under the United States National Research Council that published a report on life's limiting conditions in 2007. The report addresses the concern that a space agency might conduct a well-resourced search for life on other worlds "and then fail to recognize it if it is encountered". Gerald Feinberg (1933–1992), physicist and Robert Shapiro (1935–2011), chemist, co-authors of the book Life Beyond Earth. V.Axel Firsoff (1910–1981), British astronomer. Robert A. Freitas Jr. (1952–present), specialist in nano-technology and nano-medicine; author of the book Xenology. J. B. S. Haldane (1892–1964), a geneticist noted for his work on abiogenesis. George Pimentel (1922–1989), American chemist, University of California, Berkeley. Carl Sagan (1934–1996), astronomer, science popularizer, and SETI proponent. Peter Sneath (1923–2011), microbiologist, author of the book Planets and Life. Alternate chirality: In Arthur C. Clarke's short story "Technical Error", there is an example of differing chirality. The concept of reversed chirality also figured prominently in the plot of James Blish's Star Trek novel Spock Must Die!, where a transporter experiment gone awry ends up creating a duplicate Spock who turns out to be a perfect mirror-image of the original all the way down to the atomic level. The eponymous organism in Michael Crichton's The Andromeda Strain is described as reproducing via the direct conversion of energy into matter. Silicoids: John Clark, in the introduction to the 1952 shared-world anthology The Petrified Planet, outlined the biologies of the planet Uller, with a mixture of siloxane and silicone life, and of Niflheim, where metabolism is based on hydrofluoric acid and carbon tetrafluoride. In the original Star Trek episode "The Devil in the Dark", a highly intelligent silicon-based creature called Horta, made almost entirely of pure rock, with eggs which take the form of silicon nodules scattered throughout the caverns and tunnels of its home planet. Subsequently, in the non-canonical Star Trek book 'The Romulan Way', another Horta is a junior officer in Starfleet. In Star Trek: The Next Generation, the Crystalline Entity appeared in two episodes, "Datalore" and "Silicon Avatar". This was an enormous spacefaring crystal lattice that had taken thousands of lives in its quest for energy. It was destroyed before communications could be established. In the Star Trek: The Next Generation episode "Home Soil" the Enterprise investigates the sabotage of a planetary terraforming station and the death of one of its members; these events are finally attributed to a completely non-organic, solar powered, saline thriving sentient life form. In the Star Trek: Enterprise episode "Observer Effect" Ensign Sato and Commander Tucker are infected by a silicon-based virus, while being observed by a non-physical life forms called Organians testing humanity if they are intelligent enough to engage in first contact. A reference to The Andromeda Strain (film) was also made in this episode. In the 1994 The X-Files episode "Firewalker", Mulder and Scully investigate a death in a remote research base and discover that a new silicon-based fungus found in the area may be affecting and killing the researchers. The Orion's Arm Universe Project, an online collaborative science-fiction project, includes a number of extraterrestrial species with exotic biochemistries, including organisms based on low-temperature carbohydrate chemistry, organisms that consume and live within sulfuric acid, and organisms composed of structured magnetic flux tubes within neutron stars or gas giant cores. ↑ David J. Des Marais; et al. (2008). "The NASA Astrobiology Roadmap". Astrobiology. 8 (4): 718. doi:10.1089/2008.0819. ↑ Davila, Alfonso F.; McKay, Christopher P. (May 27, 2014). "Chance and Necessity in Biochemistry: Implications for the Search for Extraterrestrial Biomarkers in Earth-like Environments". Astrobiology. 14 (6): 534–540. Bibcode:2014AsBio..14..534D. doi:10.1089/ast.2014.1150. PMC 4060776  . PMID 24867145. Retrieved 2015-03-29. ↑ Singer, Emily (July 19, 2015). "Chemists Invent New Letters for Nature's Genetic Alphabet". Wired. Retrieved July 20, 2015. ↑ Davies, P. C. W.; Benner, S.A.; Cleland, C.E. ; Lineweaver, C.H. ; McKay, C.P. ; Wolfe-Simon, F. (2009). "Signatures of a Shadow Biosphere". Astrobiology. 9 (2): 241–249. Bibcode:2009AsBio...9..241D. doi:10.1089/ast.2008.0251. PMID 19292603. ↑ P.C.W. Davies; Charles H. Lineweaver (2005). "Hypothesis Paper: Finding a Second Sample of Life on Earth" (PDF). Astrobiology. 5 (2): 159. Bibcode:2005AsBio...5..154D. doi:10.1089/ast.2005.5.154. ↑ Sagan, Carl; Agel, Jerome (2000). Carl Sagan's Cosmic Connection: an Extraterrestrial Perspective (2nd ed.). Cambridge U.P. p. 41. ISBN 9780521783033. ↑ 8.0 8.1 Sagan, Carl (2000). Carl Sagan's Cosmic Connection: an Extraterrestrial Perspective (2nd ed.). Cambridge U.P. p. 46. ↑ Sagan, Carl (2000). Carl Sagan's Cosmic Connection: an Extraterrestrial Perspective (2nd ed.). Cambridge U.P. p. 47. ↑ 10.0 10.1 10.2 Pace, NR (2001). "The universal nature of biochemistry" (PDF). Proceedings of the National Academy of Sciences of the United States of America. 98 (3): 805–8. Bibcode:2001PNAS...98..805P. doi:10.1073/pnas.98.3.805. PMC 33372  . PMID 11158550. ↑ Gillette, Stephen. World-Building. Writer's Digest Books. ISBN 0-89879-707-1. ↑ Lazio, Joseph. "F.10 Why do we assume that other beings must be based on carbon? Why couldn't organisms be based on other substances?". [sci.astro] ET Life (Astronomy Frequently Asked Questions). Retrieved 2006-07-21. ↑ "Astrobiology". Biology Cabinet. September 26, 2006. Retrieved 2011-01-17. ↑ Cairns-Smith, A. Graham (1985). Seven Clues to the Origin of Life. Cambridge: Cambridge University Press. ISBN 0-521-27522-9. ↑ Dawkins, Richard (1996) . The Blind Watchmaker. New York: W. W. Norton & Company, Inc. pp. 148–161. ISBN 0-393-31570-3. ↑ Kan, S. B. Jennifer; Lewis, Russell D.; Chen, Kai; Arnold, Frances H. (2016-11-25). "Directed evolution of cytochrome c for carbon–silicon bond formation: Bringing silicon to life". Science. 354 (6315): 1048–1051. Bibcode:2016Sci...354.1048K. doi:10.1126/science.aah6219. ISSN 0036-8075. ↑ William Bains. "Astrobiology—the nature of life". WilliamBains.co.uk. Retrieved 2015-03-20. ↑ William Bains (June 2004). "Many Chemistries Could Be Used to Build Living Systems". Astrobiology. 4 (2): 137–167. Bibcode:2004AsBio...4..137B. doi:10.1089/153110704323175124. PMID 15253836. ↑ 19.0 19.1 "Life-like cells are made of metal". New Scientist. September 14, 2011. Retrieved 2014-05-25. ↑ "Biochemical Periodic Table – Arsenic". UMBBD. 2007-06-08. Retrieved 2010-05-29. ↑ Niggemyer, A; Spring S; Stackebrandt E; Rosenzweig RF (December 2001). "Isolation and characterization of a novel As(V)-reducing bacterium: implications for arsenic mobilization and the genus Desulfitobacterium". Appl Environ Microbiol. 67 (12): 5568–80. doi:10.1128/AEM.67.12.5568-5580.2001. PMC 93345  . PMID 11722908. ↑ Reilly, Michael (26 April 2008). "Early life could have relied on 'arsenic DNA'". New Scientist. 198 (2653): 10. doi:10.1016/S0262-4079(08)61007-6. ↑ Westheimer, F. H. (1987-03-06). "Why nature chose phosphates" (PDF). Science. 235 (4793): 1173–1178 (see pp. 1175–1176). Bibcode:1987Sci...235.1173W. doi:10.1126/science.2434996. Archived from the original (PDF) on 2011-06-16. Retrieved 2010-12-03. ↑ "NASA-Funded Research Discovers Life Built With Toxic Chemical". NASA.gov. 2 December 2010. Retrieved 2010-12-02. ↑ 26.0 26.1 Wolfe-Simon, Felisa; Blum, Jodi Switzer; Kulp, Thomas R.; Gordon, Shelley E.; Hoeft, S. E.; Pett-Ridge, Jennifer; Stolz, John F.; Webb, Samuel M.; Weber, Peter K.; Davies, Paul C. W.; Anbar, Ariel D.; Oremland, Ronald S. (2 December 2010). "A Bacterium That Can Grow by Using Arsenic Instead of Phosphorus" (PDF). Science. 332 (6034): 1163–6. Bibcode:2011Sci...332.1163W. doi:10.1126/science.1197258. PMID 21127214. Archived from the original (PDF) on 1 April 2011. Retrieved 2010-12-09. ↑ Redfield, Rosemary (4 December 2010). "Arsenic-associated bacteria (NASA's claims)". rrresearch.blogspot.com/. Retrieved 4 December 2010. ↑ Bradley, Alex (5 December 2010). "Arsenate-based DNA: a big idea with big holes". scienceblogs.com/webeasties/. Archived from the original on 8 December 2010. Retrieved 9 December 2010. ↑ Zimmer, Carl (7 December 2010). "Scientists see fatal flaws in the NASA study of arsenic-based life". Slate. Retrieved 7 December 2010. ↑ Williams, Sarah (7 November 2012). ""Arsenic Life" Claim Refuted". BioTechniques. Retrieved 23 January 2013. ↑ Basturea GN, Harris TK and Deutscher MP (17 August 2012). "Growth of a bacterium that apparently uses arsenic instead of phosphorus is a consequence of massive ribosome breakdown". J Biol Chem. 287: 28816–9. doi:10.1074/jbc.C112.394403. PMC 3436571  . PMID 22798070. ↑ Sagan, Carl (2002). Cosmos. Random House. pp. 126–127. ISBN 0-375-50832-5. ↑ 39.0 39.1 39.2 Sagan, Carl; Head, Tom (2006). Conversations with Carl Sagan. University Press of Mississippi. p. 10. ISBN 1-57806-736-7. ↑ 40.0 40.1 40.2 40.3 Sagan, Carl (2002). Cosmos. Random House. p. 128. ISBN 0-375-50832-5. ↑ 42.0 42.1 42.2 42.3 42.4 42.5 Isaac Asimov (Winter 1981). "Not as We Know it – the Chemistry of Life". Cosmic Search. North American AstroPhysical Observatory (9 (Vol 3 No 1)). ↑ 43.0 43.1 J.B.S. Haldane (1954). "The Origins of Life". New Biology. 16: 12–27. cited in Darling, David. "ammonia-based life". Archived from the original on 2012-10-18. Retrieved 2012-10-01. ↑ 44.0 44.1 44.2 Darling, David. "ammonia-based life". Retrieved 2012-10-01. ↑ Feinberg, Gerald; Robert Shapiro (1980). Life Beyond Earth. Morrow. ISBN 9780688036423. cited in Darling, David. "ammonia-based life". Archived from the original on 2012-10-18. Retrieved 2012-10-01. ↑ 46.0 46.1 Schulze-Makuch, Dirk; Irwin, Louis Neal (2008). Life in the Universe: Expectations and Constraints (2 ed.). Springer. p. 119. ISBN 9783540768166. ↑ Fortes, A. D. (1999). "Exobiological Implications of a Possible Ammonia-Water Ocean Inside Titan". Retrieved 7 June 2010. ↑ 48.0 48.1 48.2 48.3 48.4 Committee on the Limits of Organic Life in Planetary Systems, Committee on the Origins and Evolution of Life, National Research Council; The Limits of Organic Life in Planetary Systems; The National Academies Press, 2007; page 74. ↑ McLendon, Christopher; Opalko, F. Jeffrey (March 2015). "Solubility of Polyethers in Hydrocarbons at Low Temperatures. A Model for Potential Genetic Backbones on Warm Titans". Astrobiology. 15 (3): 200–206. Bibcode:2015AsBio..15..200M. doi:10.1089/ast.2014.1212. PMID 25761113. Retrieved 2015-03-25. ↑ Hadhazy, Adam (13 May 2015). "Alien Life on Oily Exoplanets Could Have Ether-based 'DNA'". Astrobiology Magazine. Space.com. Retrieved 2015-05-21. ↑ 51.0 51.1 51.2 "What is Consuming Hydrogen and Acetylene on Titan?". NASA/JPL. 2010. Archived from the original on June 29, 2011. Retrieved 2010-06-06. ↑ 52.0 52.1 McKay, C. P.; Smith, H. D. (2005). "Possibilities for methanogenic life in liquid methane on the surface of Titan". Icarus. 178 (1): 274–276. Bibcode:2005Icar..178..274M. doi:10.1016/j.icarus.2005.05.018. ↑ Strobel, Darrell F. (2010). "Molecular hydrogen in Titan's atmosphere: Implications of the measured tropospheric and thermospheric mole fractions" (PDF). Icarus. 208 (2): 878–886. Bibcode:2010Icar..208..878S. doi:10.1016/j.icarus.2010.03.003. Archived from the original (PDF) on August 24, 2012. ↑ 54.0 54.1 Mckay, Chris (2010). "Have We Discovered Evidence For Life On Titan". New Mexico State University. Retrieved 2014-05-15. ↑ Stevenson, James; Lunine, Jonathan; Clancy, Paulette (27 Feb 2015). "Membrane alternatives in worlds without oxygen: Creation of an azotosome". Science Advances. 1 (1): e1400067. Bibcode:2015SciA....1E0067S. doi:10.1126/sciadv.1400067. PMC 4644080  . PMID 26601130. ↑ Wall, Mike (28 July 2017). "Saturn Moon Titan Has Molecules That Could Help Make Cell Membranes". Space.com. Retrieved 29 July 2017. ↑ 59.0 59.1 Sneath, P.H.A. (1970). Planets and Life. Thames and Hudson. cited in Boyce, Chris (1981). Extraterrestrial Encounter. New English Library. pp. 125, 182. ↑ Jander, Gerhart; Spandau, Hans; Addison, C.C. (1971). Chemistry in Nonaqueous Ionizing solvents: Inorganic Chemistry in Liquid Hydrogen Cyanide and Liquid hydrogen Fluoride. II. N.Y.: Pergamon Press. cited in Freitas, Robert A. (1979). "8.2.2". Xenology: An Introduction to the Scientific Study of Extraterrestrial Life, Intelligence, and Civilization. Sacramento, CA: Xenology Research Institute. ↑ Freitas, Robert A. (1979). "8.2.2". Xenology: An Introduction to the Scientific Study of Extraterrestrial Life, Intelligence, and Civilization. Sacramento, CA: Xenology Research Institute. ↑ Darling, David. "solvent". Retrieved 2012-10-12. ↑ Jander, J.; Lafrenz, C. (1970). Ionizing Solvents. I. Weinheim/Bergstr. : John Wiley & Sons Ltd., Verlag Chemie. cited in Freitas, Robert A. (1979). "8.2.2". Xenology: An Introduction to the Scientific Study of Extraterrestrial Life, Intelligence, and Civilization. Sacramento, CA: Xenology Research Institute. ↑ Choi, Charles Q. "The Chance for Life on Io". Retrieved 2013-05-25. ↑ David W. Koerner; Simon LeVay (2000). Here Be Dragons : The Scientific Quest for Extraterrestrial Life:. Oxford U.P. p. 202. ISBN 9780198033370. ↑ 66.0 66.1 Budisa, Nediljko; Schulze-Makuch, Dirk (8 August 2014). "Supercritical Carbon Dioxide and Its Potential as a Life-Sustaining Solvent in a Planetary Environment". Life. 4 (3): 331–340. doi:10.3390/life4030331. PMC 4206850  . PMID 25370376. ↑ 67.0 67.1 Ward, Peter D.; Benner, Steven A. (2007). "Alien biochemistries". In Sullivan, Woodruff T.; Baross, John A. Planets and Life. Cambridge: Cambridge. p. 540. ISBN 978-0521531023. ↑ Houtkooper, Joop M.; Dirk Schulze-Makuch (2007-05-22). "A Possible Biogenic Origin for Hydrogen Peroxide on Mars". International Journal of Astrobiology. 6 (2): 147. arXiv:physics/0610093  . Bibcode:2007IJAsB...6..147H. doi:10.1017/S1473550407003746. ↑ Houtkooper, Joop M.; Dirk Schulze-Makuch (2007). "The H2O2-H2O Hypothesis: Extremophiles Adapted to Conditions on Mars?" (PDF). EPSC Abstracts. European Planetary Science Congress 2007. 2: 558. Bibcode:2007epsc.conf..558H. EPSC2007-A-00439. ↑ Ellison, Doug (2007-08-24). "Europlanet : Life's a bleach". Planetary.org. ↑ "NASA – NASA Predicts Non-Green Plants on Other Planets". Nasa.gov. 2008-02-23. Retrieved 2010-05-29. ↑ 73.0 73.1 Kiang, Nancy Y.; Segura, Antígona; Tinetti, Giovanna; Jee, Govind; Blankenship, Robert E.; Cohen, Martin; Siefert, Janet; Crisp, David; Meadows, Victoria S. (2007-04-03). "Spectral signatures of photosynthesis. II. Coevolution with other stars and the atmosphere on extrasolar worlds". Astrobiology. Mary Ann Liebert, Inc. 7 (1): 252–274. arXiv:astro-ph/0701391  . Bibcode:2007AsBio...7..252K. doi:10.1089/ast.2006.0108. PMID 17407410. Retrieved 2010-12-03. ↑ 74.0 74.1 "Christmas in Yellowstone". Pbs.org. Retrieved 2010-05-29. ↑ "Physicists Discover Inorganic Dust With Lifelike Qualities". Science Daily. 2007-08-15. ↑ W. Bains (2004). "Many Chemistries Could Be Used to Build Living Systems". Astrobiology. 4 (2): 137–167. Bibcode:2004AsBio...4..137B. doi:10.1089/153110704323175124. PMID 15253836. ↑ Committee on the Limits of Organic Life in Planetary Systems, Committee on the Origins and Evolution of Life, National Research Council; The Limits of Organic Life in Planetary Systems; The National Academies Press, 2007. ↑ Feinberg, Gerald; Robert Shapiro (1980). Life Beyond Earth. Morrow. ISBN 0688036422. ↑ A detailed review of this book is: John Gribbin (2 Oct 1980). "Life beyond Earth". New Scientist: xvii. ↑ V. Axel Firsoff (January 1962). "An Ammonia-Based Life". Discovery. 23: 36–42. cited in Darling, David. "ammonia-based life". Archived from the original on 2012-10-18. Retrieved 2012-10-01. ↑ Freitas, Robert A. (1979). Xenology: An Introduction to the Scientific Study of Extraterrestrial Life, Intelligence, and Civilization. Sacramento, CA: Xenology Research Institute. ↑ This work is acknowledged the partial basis of the article Darling, David. "ammonia-based life". Archived from the original on 2012-10-18. Retrieved 2012-10-01. ↑ 86.0 86.1 Shklovskii, I.S. ; Carl Sagan (1977). Intelligent Life in the Universe. Picador. p. 229. W. Bains (2004). "Many Chemistries Could Be Used to Build Living Systems". Astrobiology. 4 (2): 137–167. Bibcode:2004AsBio...4..137B. doi:10.1089/153110704323175124. PMID 15253836. This article uses material from Hypothetical types of biochemistry on Wikipedia (view authors). License under CC BY-SA 3.0. This page was last edited on 6 September 2018, at 14:15.